When I first started my traineeship at giosg, I had no idea what that term actually meant, so I googled “What is artificial intelligence?”. Turns out I wasn’t the only one looking for an answer since hundreds of thousands of people google the very same question on a monthly basis. Now that I’m surrounded by people a lot smarter than me in the matter, we decided to team up and write an 'AI for dummies' if you like, to make the term more approachable. Terms like machine learning and deep learning are subsets to artificial intelligence. Most of us interact with AI on a daily basis without even realising. The spam filter in your inbox, Snapchat face filters, Google Maps and online shops are just a few examples. Now if a dog filter on Snapchat doesn’t make AI seem less frightening, I don’t know what will. one really has an exact definition and the term is still being debated by academics all over the world. This seems to be a general misunderstanding. AI that is comparable, or could potentially outsmart human intelligence is called general AI. This type of artificial intelligence does not exist in the world today, as not even the most advanced robots can be compared to the least intellectual human being. There are too many components in natural intelligence which can’t be traced yet. So no panic, our AI team reassures us that the risk of robots taking over is not a fear of the near future. Instead, let's concentrate on the type of AI that we see around us online on a daily basis; narrowed or weak AI, This includes what playlists Spotify recommends you, what ads you see on Facebook, asking Siri for valuable advice, all those things we don’t even pay attention to anymore. This is the type of AI that can be taught to perform specific tasks, but does not have its own intelligence. Even though we don’t have an exact definition of AI, we could say it’s an artificial system that solves tasks requiring intelligence by perceiving its environment. Without a human telling it exactly what to do. 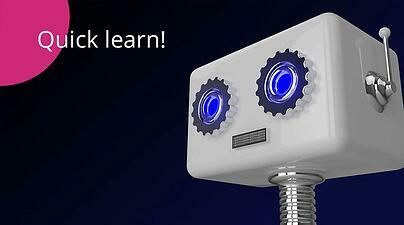 Machine learning is the type of AI that is used in most of the examples we face in our everyday lives. It’s based on a software learning through experience and using this experience to define what will happen next. The more frequent of a visitor you are, the more knowledge it will have on you. Deep learning, on the other hand, has a more complex structure and is based on attempts to model the brain functionality. The concept is built around the ideas of a 'neural network' , and although it is still a simplified version of real brain functionalities, this approach has been found to be very efficient for multiple machine-learning applications. AI solves various problems and makes many processes more efficient and easy. It assists the marketing team with promoting ads and the sales team with finding prospects. At the same time it’s replacing humans in many industries. Looking back, innovations should not be held back but let flowing freely. If they wouldn’t we would certainly not be talking about AI or Live Chats today. Sir William Preece, General Post Office, 1878. Little did Sir William Preece know that a messenger boy could be replaced by an AI powered live chat. At giosg we track visitor behavior, which includes page visits, time on site and returning visits. Based on this behavior we train a machine learning system to build a predictive model. We continuously use A/B testing to test different marketing actions to see how that affects the conversion rate. giosg can help companies whose core business isn’t AI to make use of it in their online business. 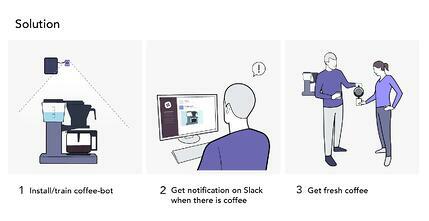 Read and see how we used AI to solve one of the most pressing daily needs, the coffee supply!